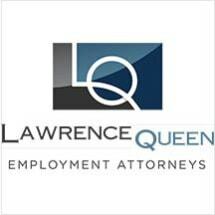 We have a team of dedicated lawyers available to represent workers who have suffered from wrongful termination, discrimination, harassment, retaliation, and to represent employees for grievances, contracts, benefits, health & safety, medical leave, wage payment, overtime, and whistleblower issues. Our lawyers are devoted exclusively to employment law and are all experienced in complex employment law issues. Because our attorneys are devoted exclusively to employment law, we are able to stay abreast of breaking legal developments that affect your rights in the workplace. LawrenceQueen prides itself on knowledge of the law, attention to detail, and thorough analysis and review of every issue in every case. We bring to each case a long history of legal competence, ethics, professionalism and standards, blended with a 21st century approach to technology. Our effective use of technology allows us to compete vigorously with even the largest of defense firms. Our mission is to provide you with quality legal counsel, individualized attention, the highest level of professionalism and a commitment to serve your needs to the fullest. These are not idle promises. These are the rules by which we live and work and the principles we follow to grow our reputation and our practice. Ongoing clear communication between client and attorney is critical to the best outcome of a legal case. As your attorneys, we promise to return your phone calls promptly and keep you regularly informed of all actions taken on your behalf, including the current status, changes and any new directions.